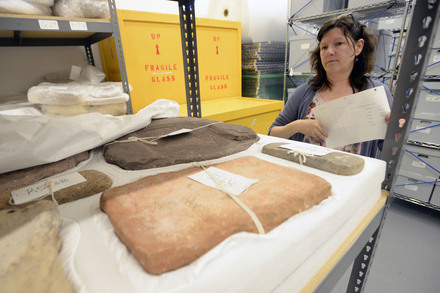 The Salt Lake Tribune follows up on the status of the objects seized during the four-corners antiquities operation. The Federal government seized some 6,000 allegedly-looted antiquities, but has no clear victim or community to return them to in most cases. The Salt Lake Tribune has video of a curator for the Bureau of Land Management supervising the warehouse where these objects are located. She shows the corn grinding stones which were removed from their context and had been used by some of the defendants to line their driveways. In Blanding and surrounding counties, residents once openly gathered artifacts and such collecting was considered a legitimate family activity. The laws changed in the 1970s, criminalizing the removal of artifacts from tribal and federal land. But looting persisted, to the dismay of archaeologists and American Indians. Graves were a favorite target because they tend to yield intact objects buried with the dead. The point of the “Operation Cerberus” investigation was not to jail looters, BLM officials said, but to rein in the illegal antiquities trade. “You can’t put [an artifact] back, but it is forever out of the black market. This effort was to start unraveling it where it started,” said Smith, an archaeologist who served as BLM’s Canyon Country district manager at the time of the 2009 raids. Will simply securing objects, without seeking to prosecute and jail individuals be an effective criminal response? It remains to be seen, but indications from the communities themselves seems to suggest that the local communities have not embraced the Federal government’s position. Brian Maffly, A trove of looted artifacts, five years after BLM raids in Utah, Salt Lake Tribune Jun 29, 2014.